ItemD-03943 - Panoramic view of the Canada/U.S. border. ItemD-04058 - "Macaulay, 1878"; Macauley Point, Victoria. ItemD-04069 - The SS Princess Vancouver going under the Lion's Gate Bridge. ItemD-07684 - "Bridge across Salmon River at junction with Pend d'Oreille River." ItemD-07689 - "Omineca Street, Hazelton." ItemD-04082 - The grave of Margaret Sophia Graves Cameron at Summerstown, Ont. ItemD-04108 - "Dawson, Y.T., the first building erected for the bank"
Item D-07684 - "Bridge across Salmon River at junction with Pend d'Oreille River." 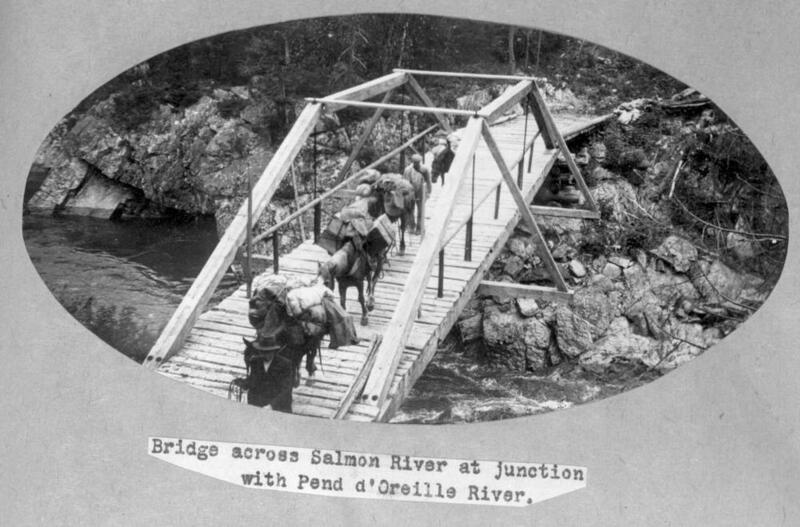 "Bridge across Salmon River at junction with Pend d'Oreille River."